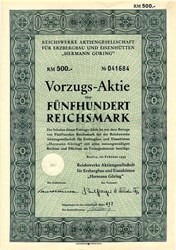 Beautiful certificate from the Vorzugs-Aktie uber Funfhundert Reichsmark issued in 1939. This historic document was printed by R.Oldenbourg and has an ornate border around it. This item has the signatures of the Company's President and Secretary and is over 68 years old. Der Spatenstich für den Bau der „ Hermann-Göring-Werke “, welche vollständig „ Reichswerke Aktiengesellschaft für Erzbergbau und Eisenhütten ‚Hermann Göring' Linz “ hieß, und Tochtergesellschaft der Berliner Reichswerke Hermann Göring war, erfolgte am 13. Was the groundbreaking ceremony for the construction of the 'Hermann Goring Works, "which completely" Reich Works corporation for mining and iron foundries, said Hermann Goering "Linz", and a subsidiary of Berlin, Hermann Goering Reich Works, which took place on 13 Mai 1938. May 1938. As the site of the village located near the Danube river town of St. was Peter/Zizlau. The reason was that the broad bands in the east of Linz, due to the permanent flooding up to St. Peter's was virtually undeveloped. It was decided therefore, to pay off the settlement and resettle the inhabitants in other districts. The area was extensively piled up with gravel to prevent future floods. When the gravel extraction in the area of Linz suffered by Weikerlsee and parts of the Pichlinger lake. Whereas as the site was originally considered including the area around Pichling and Asten, but we came to the decision, there would be lost too much agricultural land. In the same area was founded by the Nazi regime as "the nitrogen Ostmark AG" - the later Chemie Linz. 1941, after the first blast furnace was blown, started the "iron-Oberdonau" - then the division was called for pig iron production - with production of tank parts, which in the nearby factory Nibelungen St. Valentin montiert wurden. Valentin has been assembled. Until 1944, three more blast furnaces were completed, and so have been to the destruction of the factory building by American bombing raids in July 1944 produced around 1.5 million tons of pig iron for the production of armor plates. Until recently, some 20,000 people worked at the factory, which had grown alongside the other new industries to the economic engine of the city. Among the workers were in 8500 but also forced labor and 6390 KZ-prisoners from Mauthausen, which were housed in 2 camps on the premises, mainly in the division "blast furnace slag Linz Ges.mbH" were active. The population of the city rose 112,000 in 1938 to to 194,000 in 1945. However, there were also some 40,000 prisoners of war, forced laborers, displaced persons, refugees (some from villages north of the Danube, as it the imminent occupation by the Russians fear) and bomb victims in the city. Impound the former Hermann Goering was after the war as a German factories owned by the Allies (United States) and July 1946 was the newly formed VÖEST because of the "Nationalization Act" of 1946, finally become the property of the Austrian state.